Share this product and receive a $1.67 sharing discount. Amazing Photo Frame that seems more like art than a frame... and it's personalized! As long as the frame is in stock, it takes us 1 business day to create the personalization and then it will be off on it's way to you! Solid wood with a very attractive design. The color is black. Measures 13.5" x 10". Comes ready to hang. You choose the saying and add the personalized information. Promise me you will always remember... You’re braver than you believe and stronger than you seem and smarter than you think. 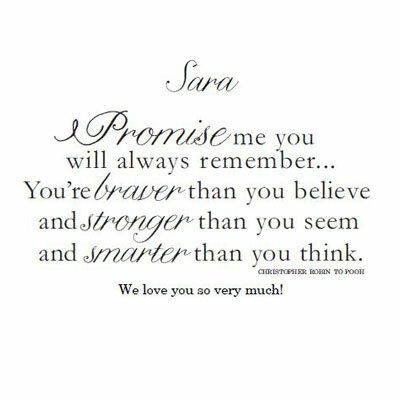 Personalize with Name (eg., Sara) and a Second Line (eg., We love you so very much). Welcome to this humble home, full of every days and mundane chores and the buzz of regular life, which is really secret code for... Here lives the most magical creatures and super heroes living the greatest love story of all time. Personalize with a Name (eg., The Bonita Family) and a Second Line (eg. Charles, Susan and Grant). May our home be filled with love and laughter. Personalize with a Name (eg., Henry and Mabel) and a Second Line (eg., Est. 1965). I can’t promise that I will be here for the rest of your life, but I can promise I will love you for the rest of mine. Personalize with a Name (eg., Quinton) and a Second Line (eg., Happy Anniversary). Blessed are those who snuggle and hug... spoil and pamper... boast and brag... for they shall be called _____. Personalize with a Name (eg., Nana) and a Second/Third Line (eg., We Love You! Brice, Bea, Ben and Brandon). _____ are angels who lift us up to our feet when our own wings have trouble remembering how to fly. Personalize with a Name (eg., Grandmothers) and a Second/Third Line (eg., Happy Birthday Grandma Jones. We love you!). Sometimes the smallest things take up the most room in our hearts. Personalize with a Name (eg., Angela Nicole) and a Second Line (eg., Baptized May 23, 2013). A faithful friend leaves paw prints on your heart. Personalize with a Name (eg., Ginger) and a Second Line (eg., Our Favorite Girl. ).